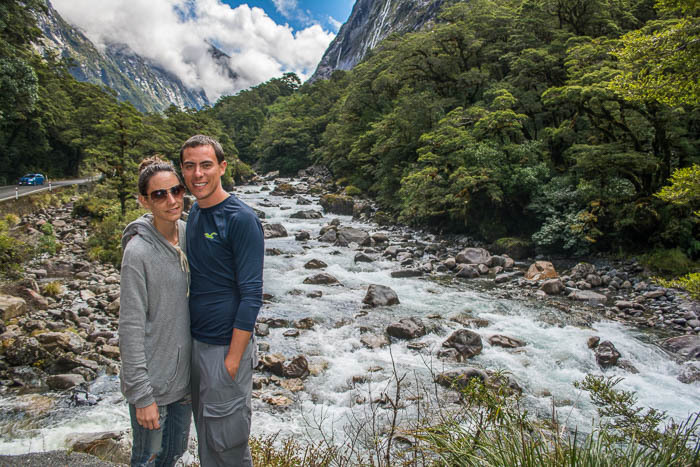 If there was one place we were really excited about exploring in our New Zealand road trip, it was Milford Sound. 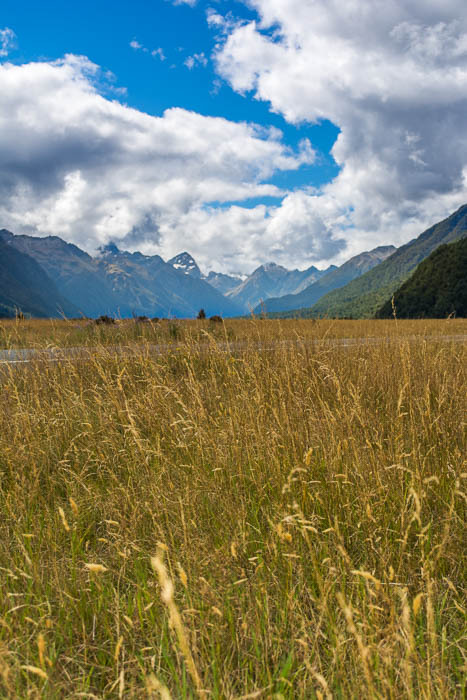 It’s the first image that pops up when you google New Zealand, and the embodiment of the scenic South Island. 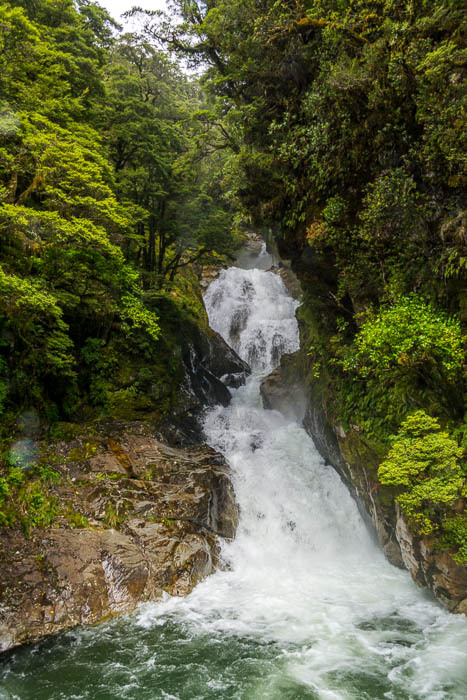 It is located on the southwest of New Zealand’s South Island. 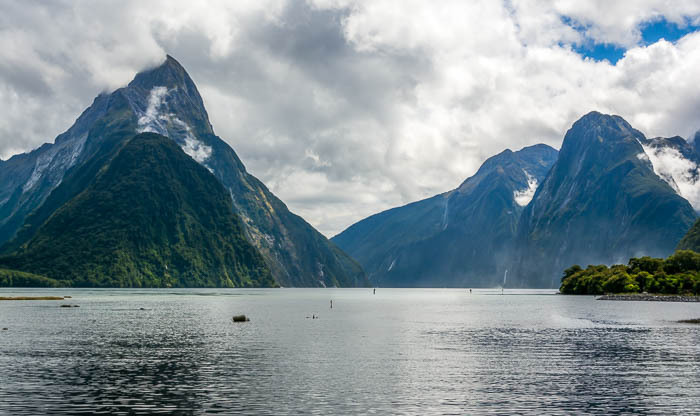 It is technically a fiord, not a sound. It receives half a million visitors each year. 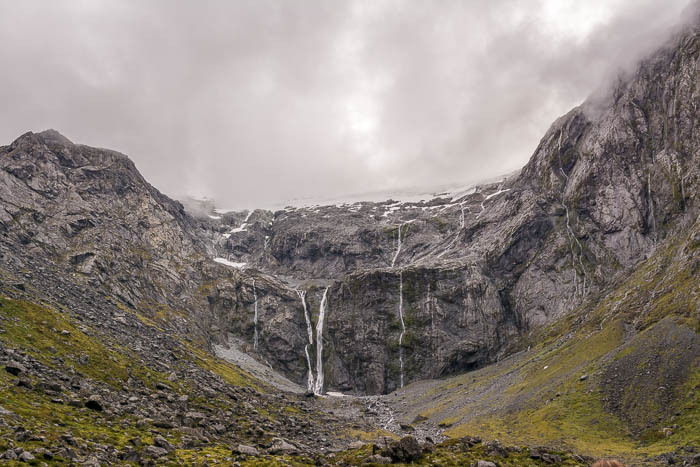 It has an average annual rainfall of 7m. The rain part? We were about to find out just how true it really is. The most popular way to get out on the water is by cruise. 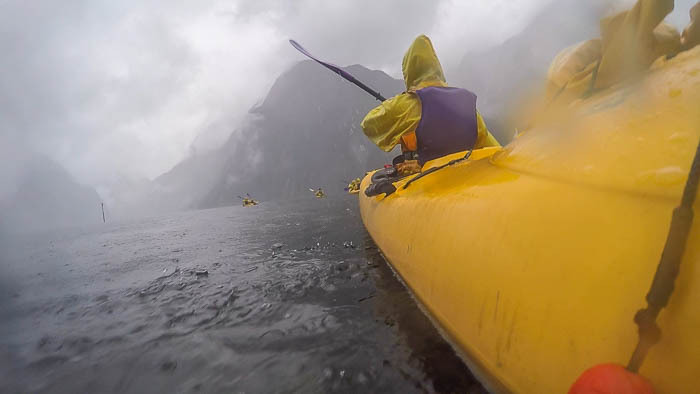 We wanted, however, something more personal and active, and nothing sounded more perfect than kayaking Milford Sound. So after hours (yes, hours. I’m an obsessive planner, don’t judge me) of looking through all of the kayak trips offered by Roscos Milford Kayaks we booked Stirling Sunriser. We chose this trip because its motto is “Go Further, See More” aaand because, if you dare, you can paddle under Stirling Falls. The day of the trip we were so excited, not even waking up at 4:30 could bring us down. We were staying in Te Anau and a van from Roscos picked us up at our holiday park. They were on time, and we were on our merry way. Things went downhill from here. 5 minutes in, our driver Olly (who was also our kayak guide) told us that we had a bit of a problem. You see, when it’s still completely dark out, you haven’t had breakfast, and you’re really cold, ‘problem’ is not something you want to hear. He explained that Roscos had overbooked the Stirling Sunriser so we couldn’t go on that trip. We could either go on Sunriser Classic (a shorter trip, less time on the water, and no paddling under waterfalls) or stay at the hotel and get a refund. Like I told you, I spent hours figuring out which of their trips best suited us, and we booked it 4 months in advance. To have that option taken away from us mere hours from going out into the water was not okay. But, staying at the hotel? Are you out of your mind?! So, we tried to look at it with the best possible attitude and enjoy whichever trip we ended up doing. 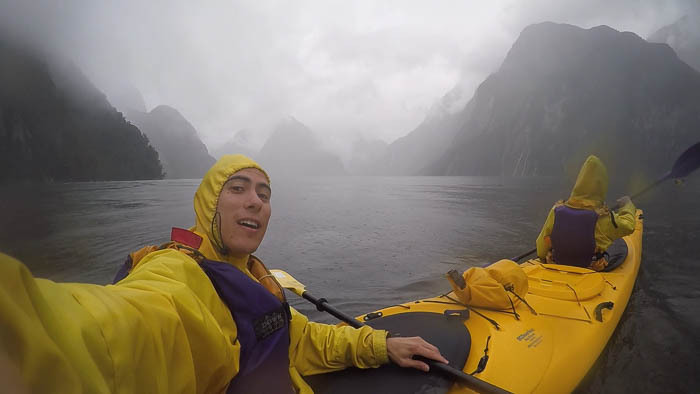 I mean, Milford Sound’s beauty and mystique weren’t going anywhere, right? 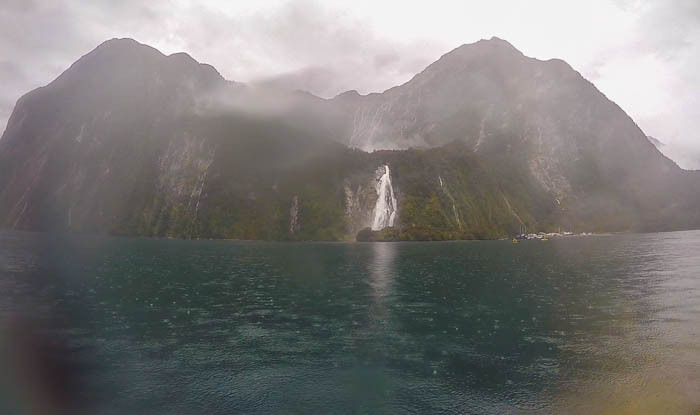 Two hours later we arrived in Milford Sound. As soon as we stepped out the van, the water greeted us. And I don’t mean the glistening waters of the sound, but the wrath from the sky. It was pouring. My-coziest-hoodie-is-already-dripping-thank-you-very-much kind of pouring. (Good thing I didn’t do my hair). They led us into a tent where they provided everything we would need. Thermal base layers, a fleece jacket, a dry skirt, which goes tied to the kayak and helps keep the rain and sand flies out, and a spray jacket. Once I changed into my yellow and purple outfit, I was a bit less worried about the cold (and totally ready to make a fashion statement). We live in California, we know fog, but the mist concealing these mountains is different. It’s dense and has a personality of its own. The water is dark, still, and kind of menacing. 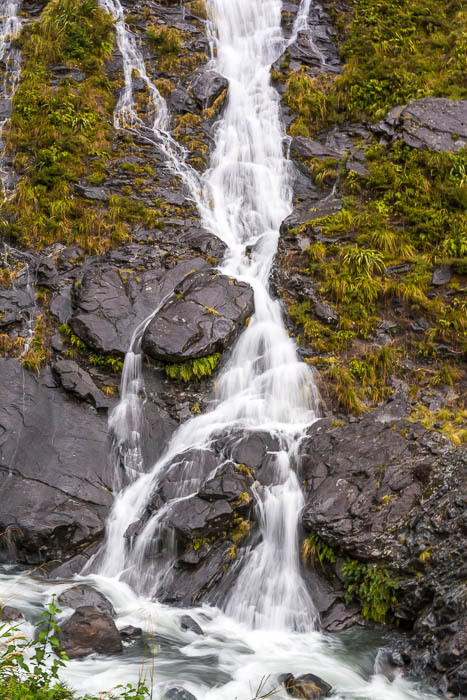 The rain had caused innumerable temporary waterfalls that trickled down rocky cliffs. A few paddles out and we’d lost sight of the shore. It’s so vast, it’s hard not to feel insignificant, and even a little hesitant of going deeper into the sound. We had a security briefing, which Olly shouted through the relentless rain. And then, we were out exploring the land we had dreamed of visiting. As the hours passed, the sun tried to find its way through the darkness and rain. We did get to see some of the fog roll in and out. Teasing, as if to show us only a glimpse of the cliffs’ mysterious elegance, just to cover them completely again. Mid-morning we stopped paddling to have a wet and mushy snack, on the water, in the world’s most beautiful picnic spot. Seriously. Is this place for real? This is when Olly explained that the land is known by the Maori as shadowland. 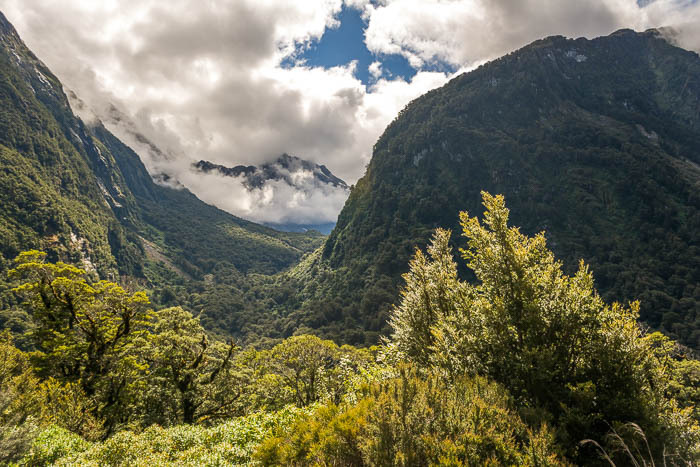 I looked up at what was visible of Mitre Peak through the fog. 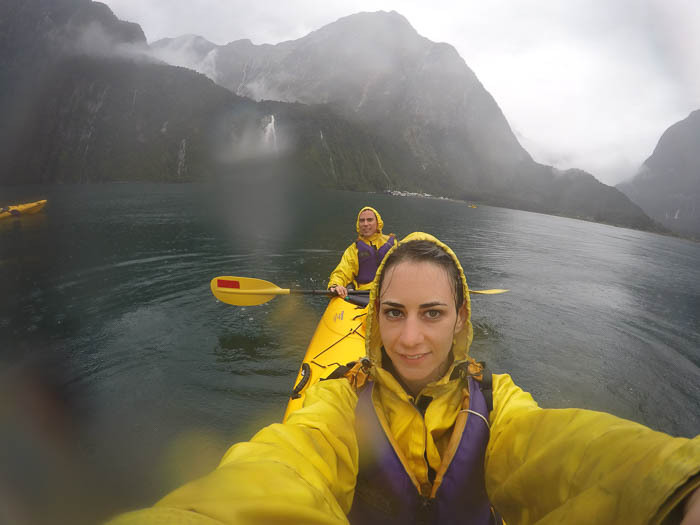 We continued paddling and got to see dramatic waterfalls, spectacular trees clinging to the edge of the cliffs by their roots, a gazillion rain drops splashing in our eyes, and even sea lions. In its remoteness and isolation, it’s full of life. 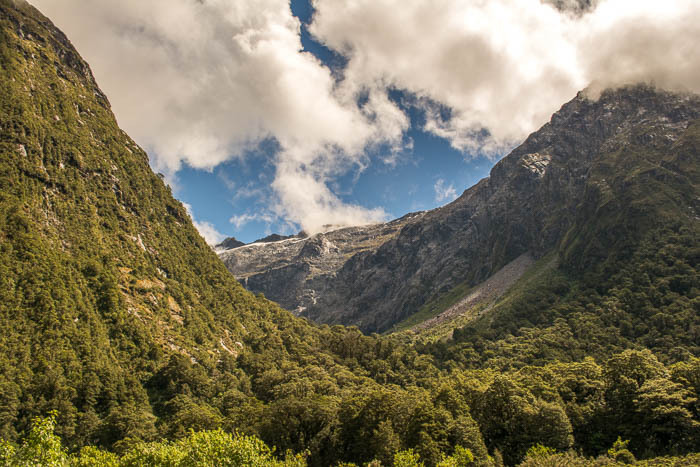 If there is one thing I can tell you about Milford Sound is that no picture will ever do it justice. 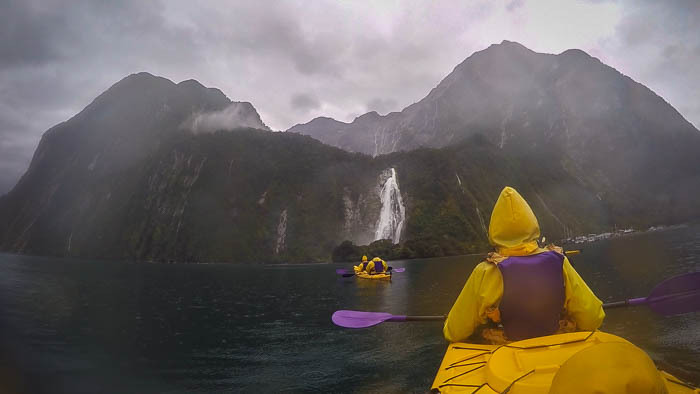 So, if looking at a photo on the screen gives you a severe case of wanderlust, imagine what it’s like to experience the majestic fiord kayaking through (and under) its waters. 4 hours later it was time to head back. It was disappointing because there was just so much more I wanted to explore, but silently, I was also eager for some dry clothes. 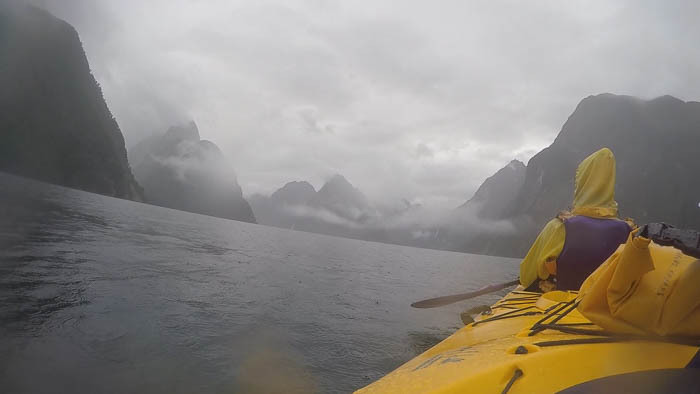 Milford Sound is rough, and wild, and it feels like from another world. It’s hard to wrap your head around its raw beauty. 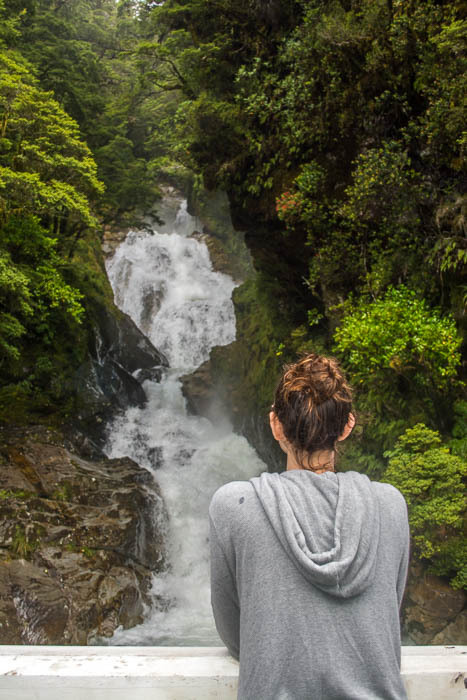 Even though it’s one of the most visited places of New Zealand, we only saw the people in our group the whole time we were there. This created a landscape perfect for feeling lost, yet perfectly aware of our own existence. Too deep? Bear with me. 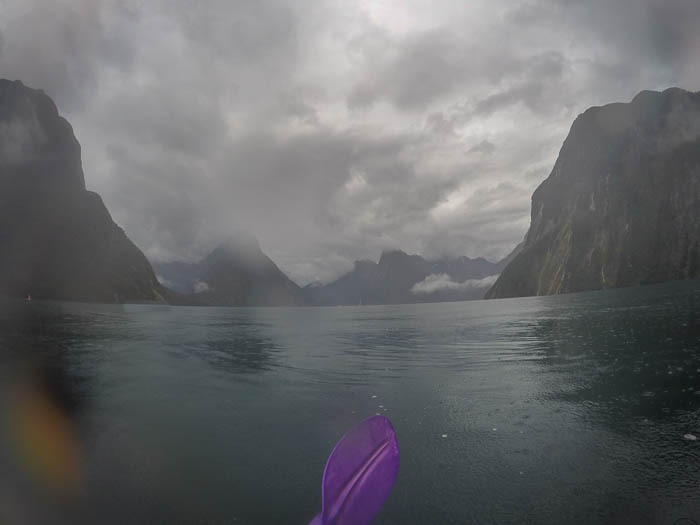 The memory of Milford Sound makes me feel poetic. On our way back, we passed by a temporary waterfall. Isaac turned us towards it and I realized his true dark intentions. He kept paddling and once the cascading water was inches away from me, I took a deep breath. The waterfall covered me completely. Seconds later Isaac, laughing, paddled back without going under the water himself. 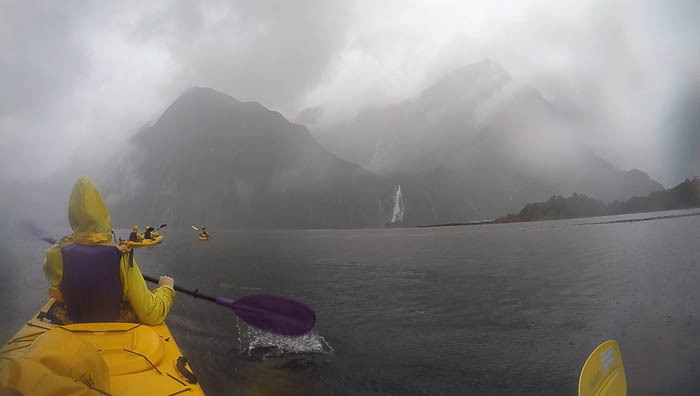 I guess, in a way, I did get to paddle under a waterfall. The funniest part? 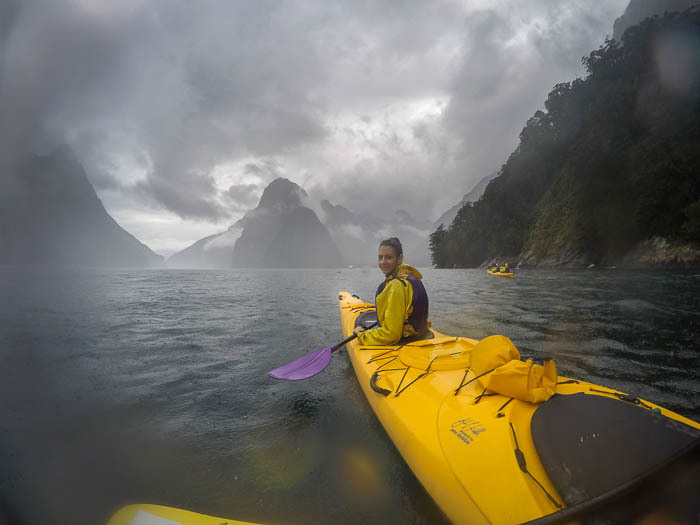 As soon as we stepped out of the water and changed into our clothes, the sun came out and Milford Sound came alive under the light. You’re right, it’s not funny at all. 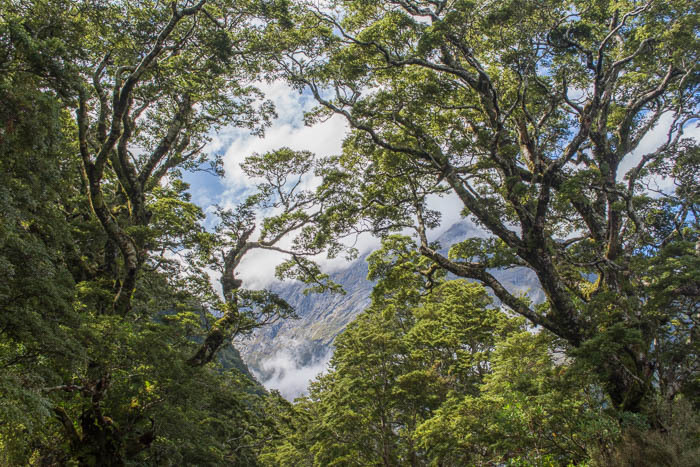 Have you gone to Milford Sound? Did you cruise or kayak? 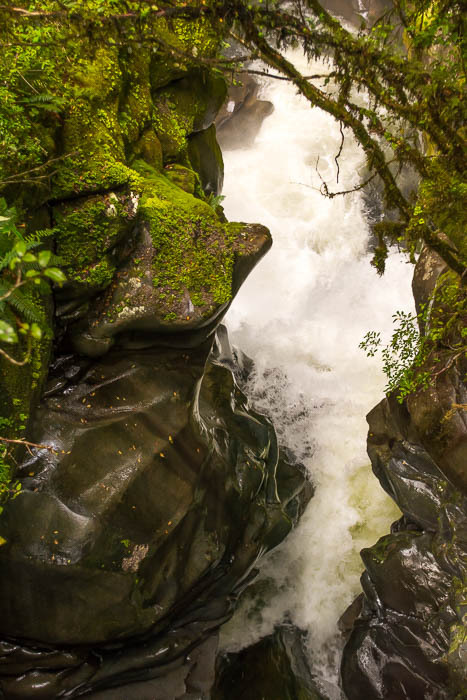 Have you paddled under waterfalls? Where? 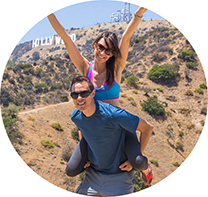 Have you been in a travel situation where things don’t go according to the plan? How did you deal?